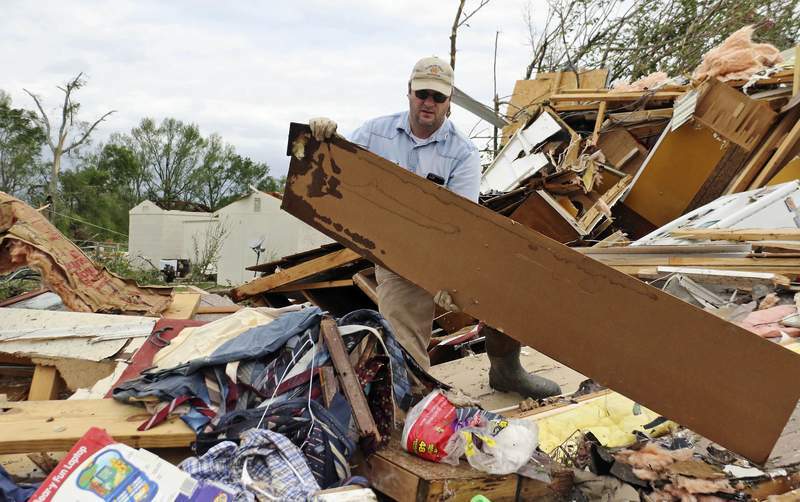 Associated Press Roman Brown, left, and Sam Crawford help a friend look for medicine in their destroyed home Sunday outside of Hamilton, Miss., after an apparent tornado touched down Saturday. Associated Press Roman Brown moves part of a wall out of his way as he looks for a friend's medicine in their destroyed home near Hamilton, Miss., on Sunday after a storm moved through the area. Nearly 90,000 customers were without electricity in Texas, Mississippi, Louisiana, Arkansas and Georgia as of midday Sunday, according to www.poweroutage.us as the severe weather left a trail of destruction. Two children, ages 8 and 3, were killed on a back road in East Texas when a pine tree fell onto the car in which they were riding during a severe thunderstorm Saturday near Pollok, about 150 miles southeast of Dallas. At least one person was killed and about two dozen others were injured after a suspected tornado struck the Caddo Mounds State Historic Site in East Texas during a Native American cultural event in Alto, about 130 miles southeast of Dallas. 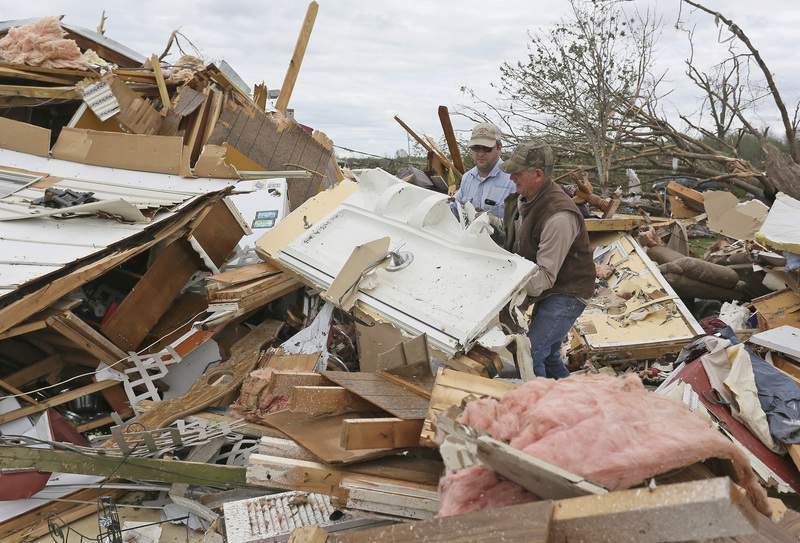 A tornado also flattened much of the south side of Franklin, Texas, overturning mobile homes and damaging other residences, Robertson County Sheriff Gerald Yezak said. The weather service said preliminary information showed an EF-3 tornado touched down with winds of 140 mph. It destroyed 55 homes, a church, four businesses, a duplex and part of the local housing authority building, authorities said. Two people were hospitalized for injuries that were not thought to be life-threatening, Yezak said. Some people had to be extricated from damaged dwellings.